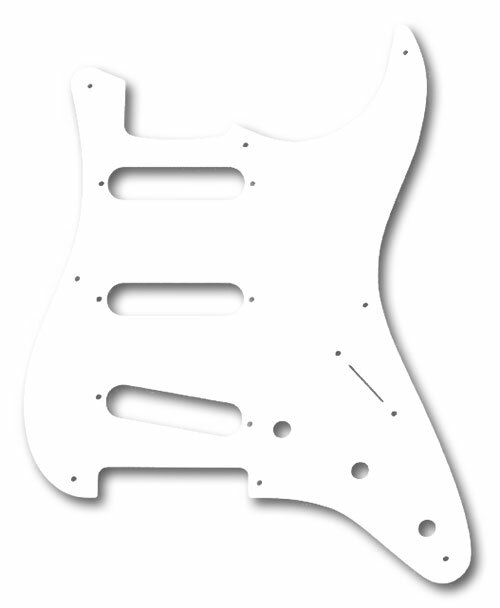 Genuine Fender® '57 vintage Stratocaster® white, 1 ply, vintage 8 hole pickguard for 3 single coil pickups. Fits '57 American vintage, SRV and Eric Clapton Stratocasters (USA) '50s Stratocaster® (Mexico). Accepts Phillips oval head pickup and selector switch mounting screws. This pickguards perimeter edge is vertical/straight cut, it does not have a 45 degree bevel edge. It is approximately 0.060" in thickness. Both of these characteristics are true to mid 1950's specs.